Mold and mildew are a type of fungi – tiny organisms that thrive in any moist, humid environment. Both mildew and mold stains are unsightly and can take over your outdoor surfaces if left alone. Keep reading to learn how to use Wet & Forget Outdoor to easily clean up tough mildew and mold stains. What do mold and mildew stains look like? Mold and mildew are a type of fungi that thrive in damp, moist environments. If not kept in check, mold and mildew can spread to affect large areas of your roof, deck, your home’s exterior, and other outdoor surfaces. Mold is usually has a fuzzy or slimy appearance. Mold spots may appear on a surface in several different shades – blue, green, gray, black, etc. Soft surfaces like outdoor fabrics, pillows, and awnings covered in mold can eventually rot away. Mildew typically looks gray, white or yellow in color, and over time, turns darker (black or brown). Mildew grows in a flat pattern and has a powder-like appearance. What’s the difference between a mold stain and a dirt stain? 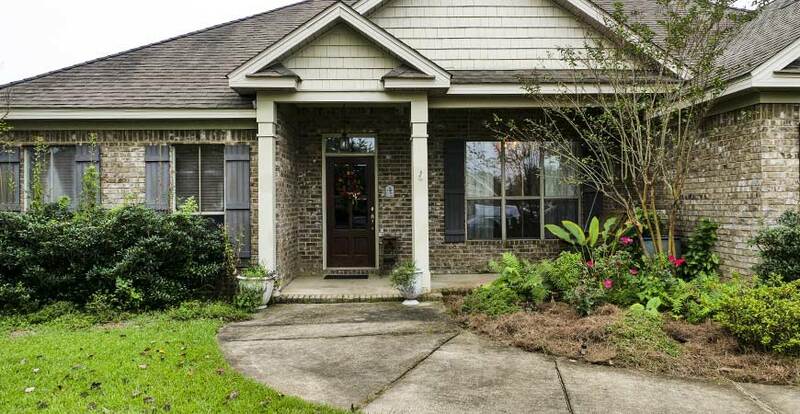 Those black streaks running down your driveway may appear to be dirt but look again. If you spray the area with the hose and the stain doesn’t budge, it’s probably mold or mildew. Garden dirt can be removed with soap, water, and a light scrubbing – mold and mildew can’t. How can I remove mold and mildew stains from outdoor surfaces? Wet & Forget Outdoor is an easy-to-use mildew and mold stain remover. Wet & Forget’s gentle and effective cleaning formula works with the wind and rain to remove ugly black and green stains and leaves your outdoor surfaces clean and growth-free for up to one year – or longer. No rinsing, scrubbing or power washing is needed. Just spray Wet & Forget on your exterior surfaces and you’re done! Easy! Wet & Forget Outdoor is available in over 18,000 retail locations nationwide including Walmart, Lowe’s, Menards, Ace Hardware and select hardware, home, and garden centers. Visit our Store Finder for a store near you. Or, click here to order Wet & Forget Outdoor through our secure website. How can I remove mildew and mold stains from my wood or composite deck? Remove those ugly green and black mold stains on your deck with Wet & Forget Hose End. Spray your wood or composite deck with Wet & Forget no rinse cleaner. Allow the surface to dry (4-5 hours). Let Mother Nature do the rest of the work for you! How do I remove mold stains on outdoor fabric? Spray your outdoor fabrics with Wet & Forget. That’s it! The rain and wind will lift the stains off the outdoor fabric for you. Did you know? Wet & Forget Outdoor also removes moss, lichen, algae, mold, and mildew from outdoor surfaces, too. How do I remove mold stains from boat seats? If your boat is stored in a dark, damp location, come spring, you may find mold stains on your boat seats, boat carpeting, and boat exterior. Before putting your boat back in the water, treat the mold stains with Wet & Forget. Spray down the seats and boat surfaces with Wet & Forget Outdoor. Allow the product to dry thoroughly. Before using seats – rinse with water. 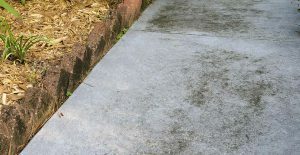 How do I remove mildew stains from concrete driveways? 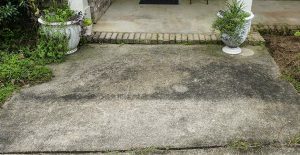 Those ugly black streaks running down your driveway may be dirt, or they may be mold and mildew stains? If you can’t rinse the stain away, it’s definitely mildew or mold staining. Concrete surfaces such as driveways, patios and pool surrounds can develop mildew and mold stains easily which can make the exterior of your home appear rundown. A large amount of mold and mildew can also create a slippery surface that makes visitors susceptible to a fall. Additionally, you may be fined by your Homeowners Association if you let mildew and mold stains linger on your exterior surfaces. Wet & Forget Outdoor is a gentle yet effective cleaner that works with the wind and rain to remove algae, lichen, moss, mold, and mildew from your concrete surfaces. And keeps ugly growth away for up to a year or more. Wet & Forget is safe to use on any concrete surface including walls, patios, steps, driveways, sidewalks, and pavers. And unlike other cleaning methods, no scrubbing or rinsing is necessary– just spray the affected area and walk away. Wet & Forget Outdoor does the job for you. Simple and easy! Attach Wet & Forget Hose End to your garden hose and attach the Flat Fan Tip for your application. Turn the water spigot on and turn the black dial to the “WATER” setting. Turn the black dial to the “ON” setting. Apply Wet & Forget to the stained concrete. Twist the dial to the “WATER” setting and wet down nearby plants again. Turn the dial to the “OFF” setting. Let the surface to dry for 4 to 5 hours. Wet & Forget Outdoor does the cleaning work for you! Reapply Wet & Forget Outdoor once a year, or if regrowth occurs. 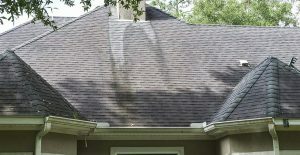 How do I remove mildew stains from my roof? Did you know cleaning your roof can extend its life for up to 20 years or longer? Cleaning your roof of ugly mildew and mold stains is quick and easy with Wet & Forget Hose End. 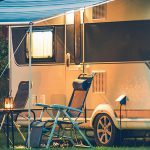 The Jet Tip allows you to reach up to 30 ft. high, making applying Wet & Forget to your roof quick and easy. Connect Wet & Forget Hose End to your garden hose. Attach the Jet Tip to reach high elevations. Turn the water faucet on and then turn the dial on Wet & Forget Hose end to the “WATER” setting. Turn the black dial to the “ON” setting and treat your roof with Wet & Forget. Move the dial to the “WATER” setting and rinse nearby landscaping. Turn the dial to the “OFF” setting. Wet & Forget will work over time with the rain, wind and even snow to clean up the mold stains. How does cleaning my roof help maintain it? 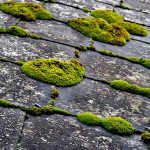 A roof with mold, mildew, moss or algae on the surface runs the risk of these ugly growths attaching to the surface and eventually growing into your shingles. The attached growth breaks down roofing material, creating porous areas for water to get in. The standing water can work its way inside your home to stain ceilings and walls. Any moisture making its way indoors encourages the growth of indoor mildew and mold. 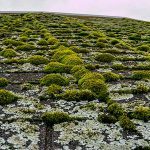 Plus- if you let moss grow on your roof you may have your homeowner’s insurance canceled. A quick application of Wet & Forget Hose End will stop mold and mildew in its tracks, so you won’t have to worry about any potential damage on your roof or insurance policy cancellation. 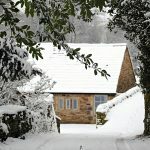 For more information on how to clean your roof, click here.